The first thing that comes to your mind as you enter Los Escobar’s is – ‘What a great bar.’ And that’s not it, the the view from the place is just as good. The place with its shiny marbles and huge chandeliers gives a royal vibe. The large glass walls and ceiling mean you can come here even during the afternoons and enjoy the warm winter sun while having your favourite drink. While doing so, you can check the view from the bar, which is quite majestic especially during the evening sunset. While the day scene is good, the night view is great. The place completely transforms itself. The chandeliers come into play and the mild lighting makes the place ideal for a romantic date. The Italian marbles complement the lighting and the music sets a great scene for an enjoyable time with family and friends. 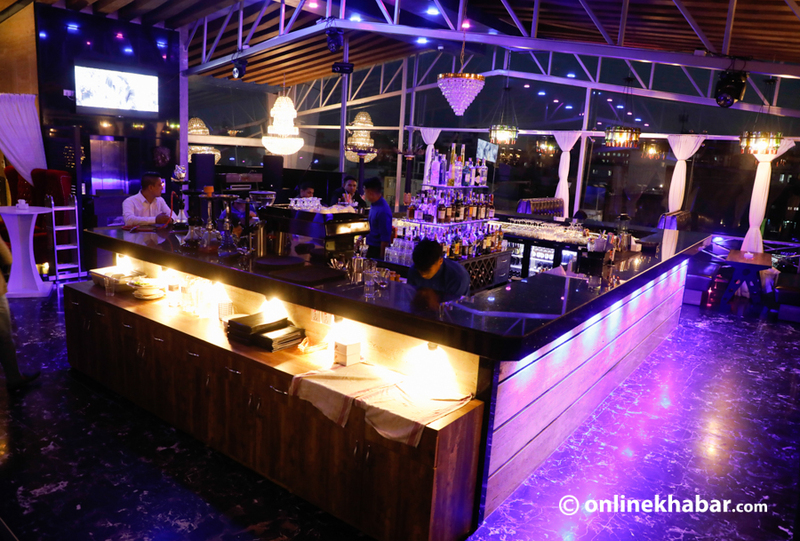 Opened two months ago by owners of clubs like X-Zone and Platinum, Los Escobar’s gives the people around Baluwatar and Naxal a new place to chill out at. Even though people might think this is a bar, the place also has a wide food menu. The first meal you can try is the chicken pad Thai. 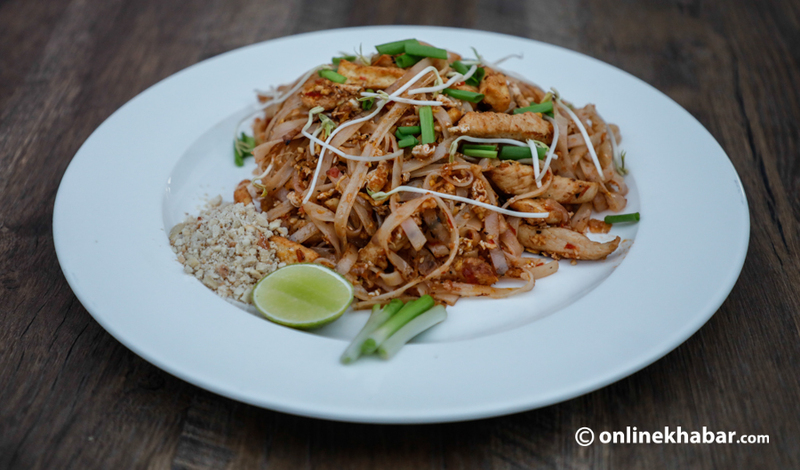 The dish is as good as a pad Thai in any other Thai restaurant. It has a blend of sweet, salty, umami and sour flavour and the peanuts topping on the top gives it more taste. Unlike other pad Thai noodles, this one is not sweet, and the spicy taste gives the meal added zest. 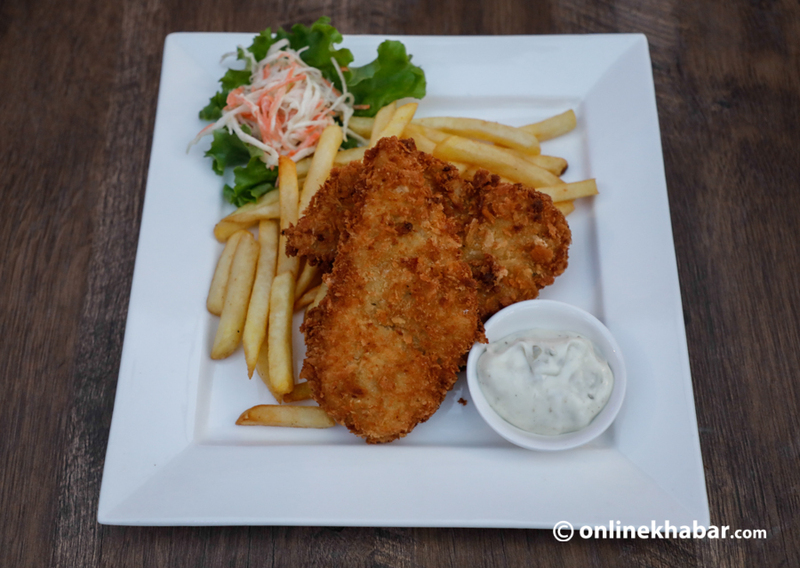 For the next meal, you can choose a classic bar food – the fish and chips. The battered cod is warm, salty, greasy and cooked perfectly. The crunchy outer batter compliments the moist fish inside, which makes this dish one to try when you visit Los Escobar’s. The place also has items like cheese balls, chicken cheese roll, prawn cocktail and mutton sukuti, which have been received well by its customers. 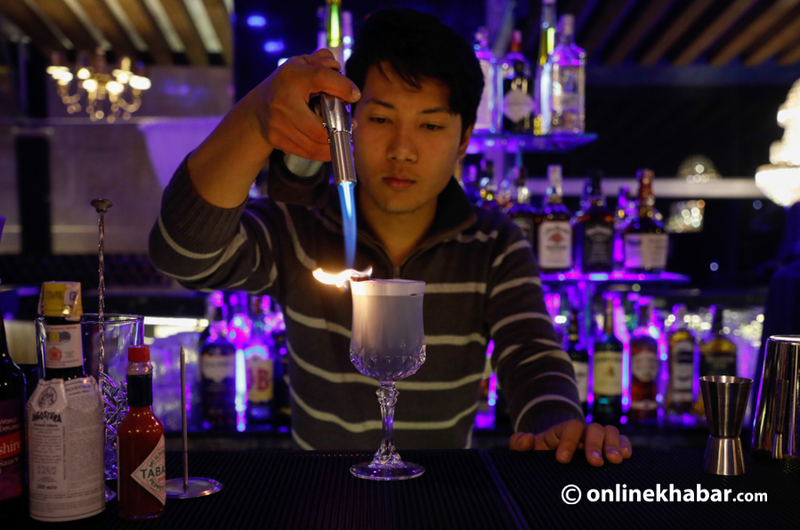 Bartender Sanjay Lama preparing Himalayan Cloud. After indulging on a fulfilling meal, you can go to the bar, where the bartender Sanjay Lama serves you two Los Escobar’s specials – The Nature Mule and Himalayan Cloud. 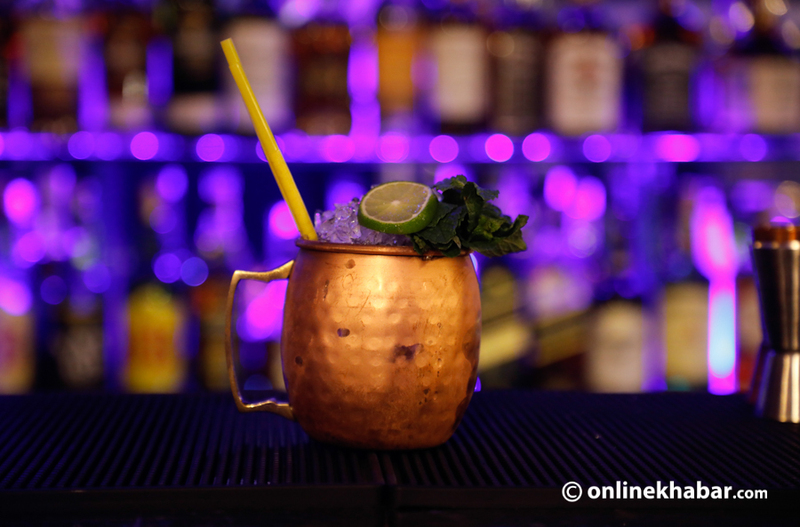 The Nature Mule is a vodka-based cocktail served in a copper mug. The drink has vodka, fresh ginger, fresh mint, lime juice, simple syrup, and ginger ale. The drink is refreshing, tangy and has a bit of a bite and kicks to it. It has a snappy spice that is unique and invigorating and the way it is served makes it utterly spectacular. Himalayan Cloud is another vodka-based cocktail and is quite different from the Nature Mule. The drink has vodka, lime juice, simple syrup, Cointreau, blue curacaos, grenadine, and egg white. 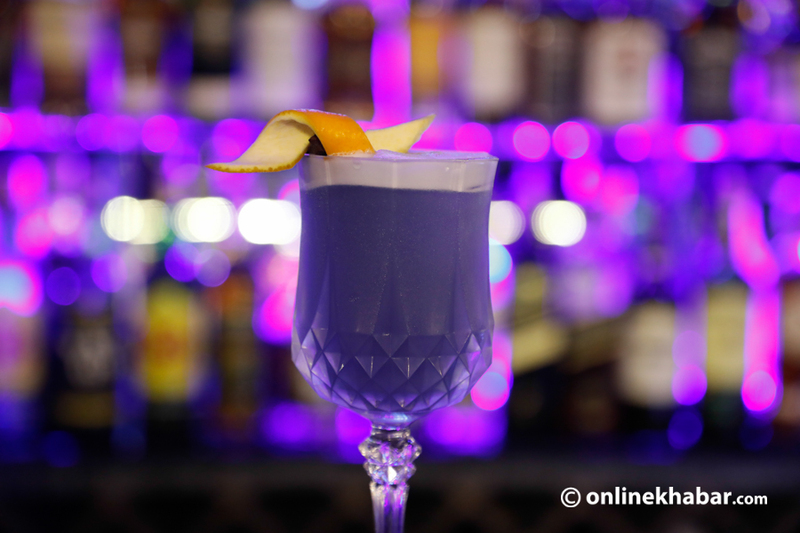 The drink has a creamy taste and the blend of orange liquor and vodka gives it a strong taste. The smoked star anise also adds a unique aroma to the drink. Definitely, a must try when you’re at Los Escobar’s. Los Escobar’s hosts ladies night every Wednesday where they offer free cocktails to all ladies. The place is abuzz on Fridays and Saturdays. The place is definitely worth a visit. 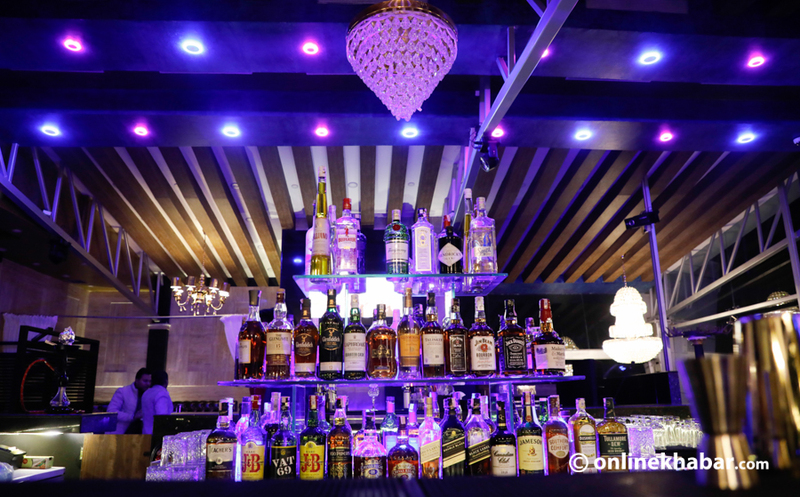 Priced as same as other lounge and bar in the area, this place offers its customers a bit more. The members of the staff are well trained and polite and the ambience is just brilliant. In a time when places hardly stand out, Los Escobar’s is a place that really does.